Venus is the second closest planet to the Sun, and it comes closer to Earth than any other planet ( about 42 million kilometers ). It is only slightly smaller than Earth and is covered with an opaque layer of highly reflective sulfuric acid clouds. Its proximity, reflectivity and size make it the brightest natural object in the night sky apart from the Moon. Venus reaches its maximum brightness shortly before sunrise or shortly after sunset. For this reason it is often called the Morning Star or the Evening Star. 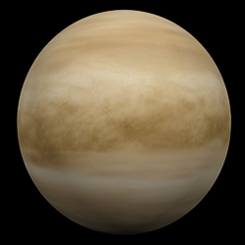 Venus has the densest atmosphere of all the terrestrial planets, consisting mostly of carbon dioxide. The atmospheric pressure at the planet's surface is 92 times that of the Earth and there is no organic life. Venus is believed to have once possessed oceans of water that evaporated as the planet's temperature rose. Eventually the water vapor dissociated, and because of the lack of a planetary magnetic field, its hydrogen was swept into space by the solar wind. It was finally mapped in detail by Project Magellan during 1990 and 1991. The Magellan space probe used radar to produce the first high-resolution global map of Venus. During 2005, the Venus Express mission sent another probe to Venus and as of 2009 it was still collecting data. Part of the Venus Express mission was to observe signs of life on Earth from Venus orbit. In the pictures, Earth is less than one pixel in size, providing an observing challenge similar to viewing planets in other solar systems from Earth based telescopes. By comparing the data, scientists are looking for clues that will assist in habitability studies of extra-solar planets. Named after the Roman goddess of love, Venus was a subject of much fantasy and speculation until the twentieth century. Venus was once promoted by UFO contactees such as George Van Tassel and George Adamski as a home world for extraterrestrial intelligence. However the harsh conditions on Venus make it totally inhospitable to complex life. When this fact was established, it quickly eroded the credibility of those who had made contactee claims, particularly those who had promoted the idea of Venusian civilizations. Perhaps Venus's most significant contribution to ufology are the many UFO reports it has evoked. Venus is so bright that under the right circumstances it can be mistaken for a distant daylight disk. Studies have been carried out by qualified observers, including astronomers, who have concluded that misidentification of astronomical phenomena, including the planet Venus accounts for about about 22% of all UFO reports. The debunker Robert Sheaffer also makes a compelling case that the famous UFO sighting by President James E. Carter was actually the planet Venus.